It's a new year, but a CNN panel hosted by Nia-Malika Henderson took a few moments this weekend to reflect on Democrats' poor messaging in 2017 - poor messaging which resulted in their pacing far behind the Republicans in fundraising. As of November, the RNC had $39.8 million in cash on hand, to the DNC's $6.3 million. Jake Tapper also remarked on the Democrats' dry fundraising on Twitter. It's kind of a big deal, he noted. Former interim DNC chair Donna Brazile dished on the Democrats' disorganization during a book event in Washington, D.C. last month. For an hour, she described the DNC's inability to patrol its funds and its catering to Hillary Clinton during the 2016 election. 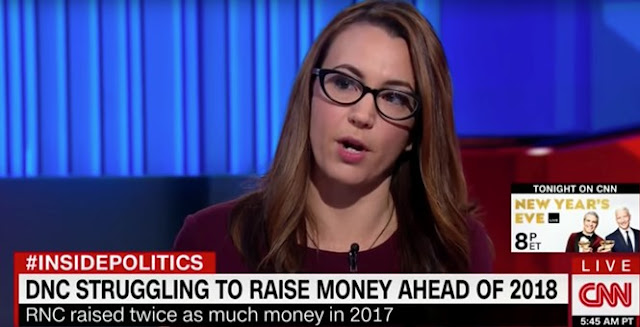 It's that last sticking point that has stopped small donors from giving the DNC one penny, Wall Street Journal's Julie Bykowicz mused during the panel discussion. They feel like the committee "forced" Clinton on them, without even considering giving Bernie Sanders a fair shot at the nomination. As for big donors like Tom Steyer, they are too busy spending their money on farfetched impeachment efforts against President Trump. "It's a tough year for the Democratic Party to try and rebrand itself and market itself in a way that is attractive to small donors and big donors alike," she said. “How is that going?” Henderson asked her panel, chuckling. The Democrats “have not articulated their rationale for being put back into power” other than that they would stop Trump, Karen Tumulty of The Washington Post noted.